Trainer Kevin Attard was still riding the high of a graded stakes win on Sunday morning, the day after former claimer Starship Jubilee picked up the Grade 2 Canadian Stakes at Woodbine. It was the 5-year-old mare's second graded win, but hardly the first for Attard, who passed up the chance for a raucous celebration and left the track to attend his son's hockey game and have a late dinner with family. “It's a lot easier to wake up in the morning the day after you've won,” he said, standing on the outside rail timing millionaire Melmich, a gelding who is now his most successful runner by earnings. There was a time, though, when Attard was ready to give up the chance at a Sunday morning like this one. In 2004 and 2005, Attard's numbers were down – way down. He told the Toronto Sun he only had four horses in his barn at one point and was struggling to make ends meet. For someone who isn't used to the ebb and flow of luck at the racetrack, it might have come as a surprise. The Attard name is a well-known one on the Woodbine backstretch; in fact you can hardly walk out of the barn without bumping into one of them. Attard's father Tino has trained since the early 1970s and conditioned graded stakes winners Kirby's Song and Milwaukee Brew. Sid and Larry are uncles. Cousin Steve trains. (All three have had graded stakes winners.) Cousin Josie is married to the highly successful trainer Mike De Paulo. Attard had grown up on a farm, spent weekends and summers at the track for his father, and dreamed of becoming a jockey (until he says he ate himself out of that career path at 12 or 13). By the time he went out on his own in 2001, Attard had served as hotwalker, groom, and finally assistant to his father. His racetrack education seemed complete. But wins are not given out on merit, and as much as Attard loved being around horses, it was hard to see a future. In 2006, his luck changed. Attard was asked to become a private trainer for Knob Hill Farm, which gave him the chance he needed to shine. Since then, Attard has had graded stakes success with several runners. He said his favorite was Calgary Cat, who collected multiple graded stakes wins in Canada and took Attard to the Breeders' Cup Turf Sprint in 2016. The chestnut gelding collapsed after finishing seventh in the G2 Play the King last year in an apparent cardiac event on the walk back to the barns. Newspaper accounts noted Attard running down the stretch when he saw the horse fall and holding the gelding's head as veterinarians worked in vain to revive him. More than a year later, Attard said he is still devastated by the loss. Both Calgary Cat and Starship Jubilee are former claiming runners Attard patiently brought up the ranks. Attard's father Tino picked up Starship Jubilee for a $16,000 tag in the Gulfstream Park winter meet in 2017. Although the filly had been running sprints, Attard suspected she would improve if given the chance to stretch out. Together with partner Soli Mehta, Attard bought out his father's ownership of the horse when it was time to head back to Woodbine. The filly took the opportunity and didn't look back, winning the G2 Nassau, G2 Dance Smartly, and the Sunshine Millions Filly and Mare Turf. Although she was 11-1 in the Canadian, Attard suspected she was sitting on a big race. As Attard has surfed the highs and lows of racing, he has been particularly aware of a third generation horseman waiting in the wings. His son Joshua, 15, is determined to become a trainer one day. Joshua owns two horses now and studies the Daily Racing Form closely, looking for potential claims. He can identify nearly any horse during morning training by sight, including those outside his father's barn. Attard is still holding out hope his son will fall in love with another profession, but he realizes at this point that's unlikely. Attard knows it's a losing battle. He knows as well as anyone how strong the tug of the racetrack can be. 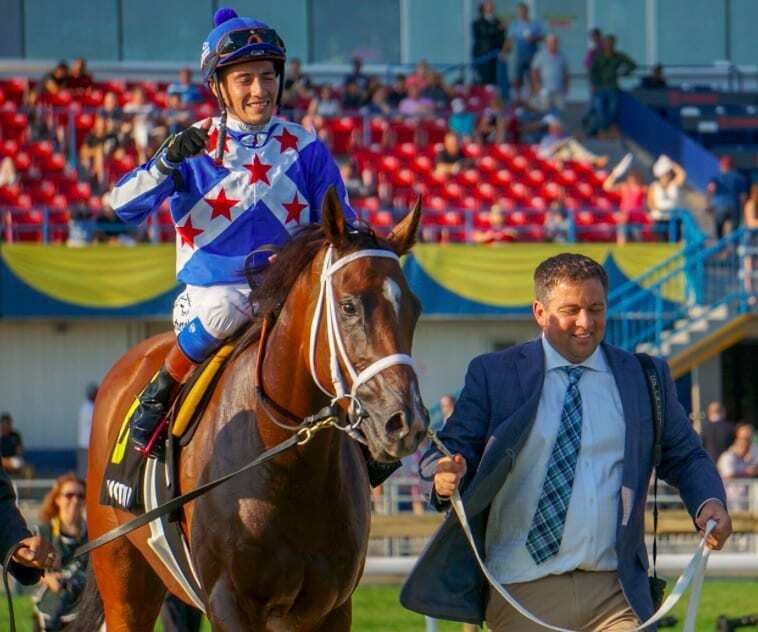 This entry was posted in Connections, NL List, People and tagged Breeders' Cup presents Connections, calgary cat, Canadian Stakes, Connections, kevin attard, Natalie Voss, starship jubilee, woodbine, woodbine racetrack by Natalie Voss. Bookmark the permalink.